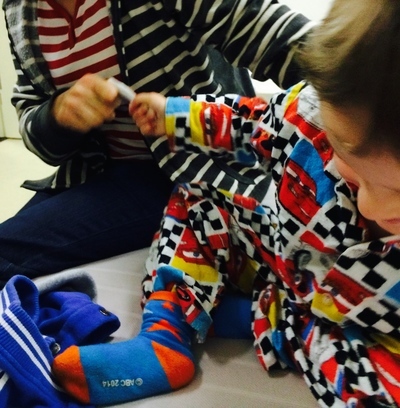 The prospect of a child having surgery can be daunting for a parent. Despite a doctors or nurse's best efforts it can be hard for all the information to sink in when you are preparing yourself for it to happen. This article is a bit of a what to expect when your child goes in for grommets in their ears or having their adenoids out which is what I dealt with recently with our three year old. Firstly it's important to remember that any good doctor is not going to recommend putting a child under anaesthetic for something they don't really need. Secondly most surgeons who do this sort of procedure specialise in children's surgery and are sensitive to your concerns, needs and are good with the kids and will be approachable and available for any questions you have. Depending on whether you go private or public, waiting times will vary. If you have private health insurance though I absolutely recommend using it, considering most covers don't have a hospital excess applicable to children meaning you will have the surgery at no out of pocket cost to you, but of course check your own policy to be sure. Going private means your waiting time is significantly reduced and from personal experience the care is very good. In the two weeks leading up to surgery there are some important things to consider. Your child should not have anything that can thin the blood such as vitamin E, Neurofen, Aspirin, gingko biloba or fish oil. Panadol should be fine however if you need to use it. Any other supplements for your child you should always consult the doctor beforehand to be sure. Fasting is for a period before the surgery is necessary. For example if surgery was in the morning you might be asked to fast your child from midnight the night before and then no fluids after a particular time. This might mean your little one is cranky for a while so it’s a good idea to have other distractions on hand such as some toys or books with you. We took a portable DVD player with some favourite DVDs which also proved very useful post surgery when you are waiting around for a few hours for observations. On admission you and the child are taken up to the ward. Even in private you will probably be in with other parents and children which allows the nurses to be more effective in noticing and acting on any changes in condition of the child quickly. 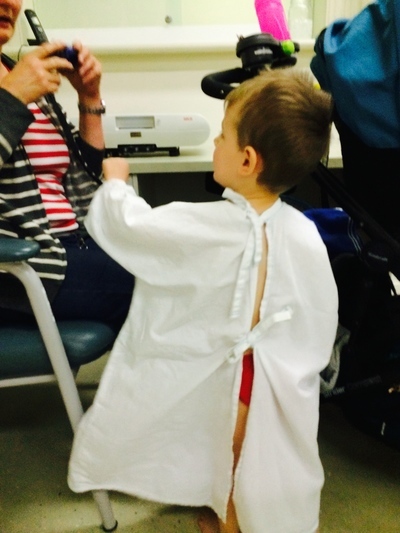 If you have other children at home see if you can leave them with someone or if that is not an option you will need to bring someone with you to help out, as someone will need to go into the theatre with the child in the first instance for the anaesthetic. Sadly I've heard some horror stories regarding anaesthetic in children and I spent a long time preparing myself to find that it wasn't as bad as what I expected. Rather than just pretend nothing is happening, depending on the age of the child, it is a good idea to explain to them what is going to happen before going in. For example saying that you are going in to a bright room with all the nice doctors and nurses and they are going to give you a mask that has medicine in it and all they have to do is sit still in your lap for a cuddle. Most kids don't like things over their face so letting them know ahead of time and that it won't hurt them is helpful. Following that up with letting them know once it’s done they can have something to eat it can be a great motivator for them to get through it smoothly as they will most likely be very hungry at that stage. The anaesthetist is also likely to visit you and your child before the surgery and will explain any risks/warning signs to you beforehand and make sure the child is well enough to have surgery. When you go to the theatre with your child you will be asked to cradle your child on your lap on a seat next to the theatre bed and a mask will be placed over their face with some laughing gas which will send them to sleep. When a child is breathing in the anaesthetic a little coughing is normal along with the eyes rolling back into their head and their body going limp. It can be confronting, but it’s important you stay calm so your child does too. The staff will then help you lift them on the bed and you will leave the room while they put in an IV and do the surgery. Surgery will take anywhere from 20 minutes to an hour depending on whether the child is having just grommets or adenoids or both. Once out of surgery they will take them to recovery until they wake and then bring them back to you in the ward for observation for a few more hours. 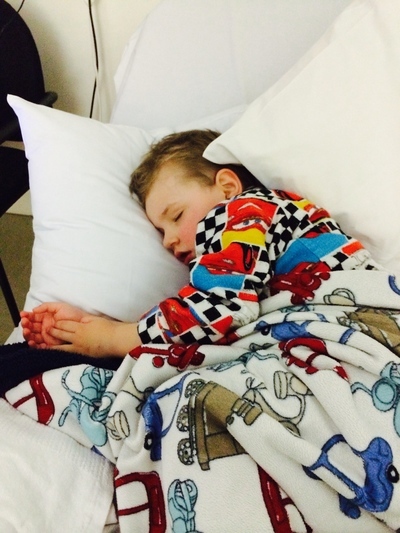 When little ones wake up from anaesthetic they can become distressed and disorientated. This is completely normal as they do not understand why they feel all foggy in the head. Unlike when an adult has surgery they know that they have had drugs and they will wear off but a child does not understand and therefore may thrash around, scream and cry uncontrollably and not know what they want or don't want. This can last up to an hour depending on the child and will be closely monitored by the nurses. All you can do is your best to reassure your child, keep calm and a tight grip if you are walking around with them as they can throw themselves around a bit. If you have a comforter with you such as a bottle, dummy or toy this could be beneficial in helping the child settle. We found a bottle of milk to be the most effective as the sucking action calmed him down a lot quicker. The child will also still have an IV connection strapped on to them in case of an emergency or needing further medication or fluids. They will possibly dislike it and try to pull it out. Our son was particularly upset about anything touching him such as the IV and wrist bands so we were able to get the nurses to remove them as soon as he had drank some bottle and kept it down; doing that calmed him much more quickly. Once the drugs wear off and the child is much calmer they will most likely need to sleep to recover properly. Don't stress out if they end up drenched in sweat despite the room temperature as this is how their body detoxes and expels the drug from their system and is completely normal. Observations usually last about 4 hours post surgery and as long as the child has eaten and drank something and been to the toilet they will send them home with a course of oral antibiotics and ear drops to minimise any inflammation. Neurofen can also be given post surgery for pain relief and as an anti-inflammatory works well. I found the ear drops particularly difficult to administer as the bottle we received required 3 drops in each ear 3 times a day. Doing that with a resistant toddler is not the easiest thing in the world. I found the easiest and quickest way to administer (by myself) was to lay my son over my lap on his side with my legs wrapped over his to prevent him lashing out and my left arm around his arms, his head on my knee and administering the drops as I rested my elbow on his head to prevent him lifting or turning it. While it feels really mean at the time, it minimised his movement and got the job done quickly. I then just flipped him over to do the other side. I would give him something calming straight after such as a bottle or a treat to distract him. In the case of grommets, it’s a good idea to avoid washing hair in the bath as the water contains a build-up of bacteria and can cause infections in the ear and for a few weeks don't let them go swimming. Even after a few weeks if they are going to swim, stick to the beach or chlorinated pools as water in creeks, dams etc. will easily pass through the grommets and take in a whole lot of bacteria causing more issues and inhibiting the healing process. Kids are usually fine to return to normal activities 24/48 hours post surgery such as child care or school as well as fly. If you have any concerns about ongoing discomfort you can always visit your local GP or call the surgeon to check it out. Follow up appointments are usually four weeks post surgery and roughly six monthly there onwards. Sometimes there will be a hearing test performed to make sure any previous hearing loss has been resolved.